We wrote about the AT&T Infuse 4G yesterday and we were thoroughly impressed with the handset. And apart from the sleek looks and a large display there’s something that is quite out of the ordinary about the device. As most AT&T users might know, downloading of third party apps is not supported on its network. But this time with the Infuse 4G, AT&T is actually allowing side-loading of third party apps which is a very good supplement to the handset. 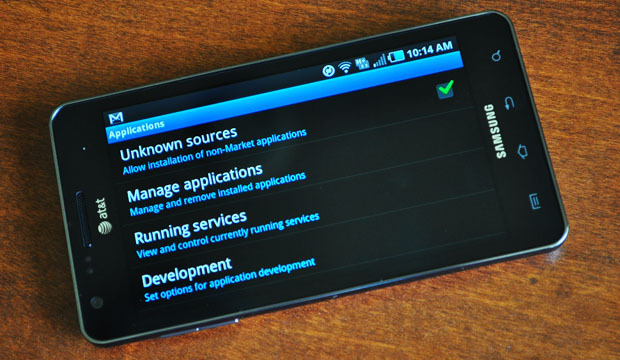 Most Android smartphones we find in the market has this option to toggle the unknown sources button, which when toggled allows you to download application from sources other than the Android Market or Amazon’s AppStore. These applications include the ones in Beta and also those that didn’t get the nod by Google or Amazon for the Android Market and the Amazon AppStore. And since AT&T doesn’t often give users the freedom to do that, we were rather surprised. It’s really good to see AT&T breaking the shackles with their devices, well with the Inspire 4G at least. AT&T’s excuse to not allowing side-loading of third party apps was that apps from unknown resources could cause harm to the network. Well we certainly hope that doesn’t happen with the network which could make AT&T reconsider their decision.